Freeman stiff-arming and low-key flexing for the crowd as he walks in a touchdown. 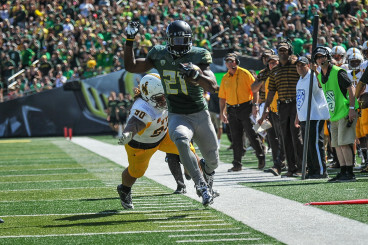 Last season, freshman sensation Royce Freeman took Autzen Stadium by storm. The freshman, from Brawley, Calif., became a household name in Tracktown within the first two games of his college career, posting back-to-back multiple touchdown performances against South Dakota and Michigan State. 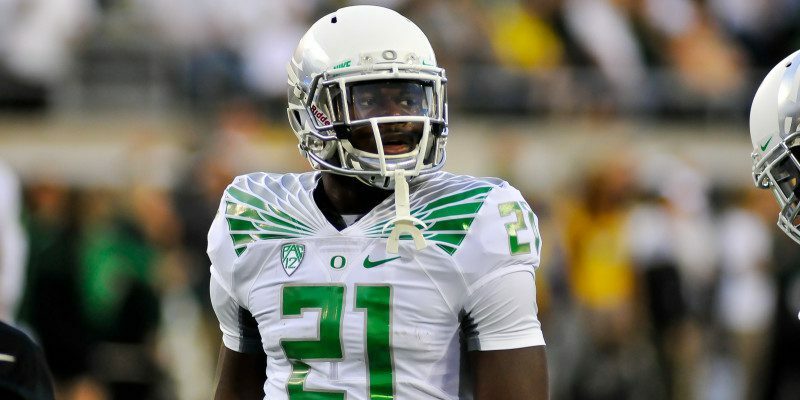 Even with veteran backs Byron Marshall and Thomas Tyner in the stable, Freeman managed 1,365 yards on 252 attempts, with 18 touchdowns. Freeman has no intention of having his freshman year be his best statistical year, the sophomore is ready to lead a dangerous running attack in 2015-16. My colleague Norm Hightower had a quick interview with Freeman to see how spring practice is coming along. 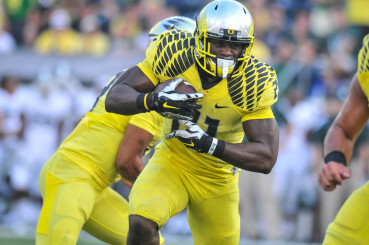 Freeman’s style of play has been compared to that of Marshawn Lynch. While the comparison is up for debate, the two definitely have a very similar interviewee style: short, sweet, and to the point. Norm: How is spring practice going for you? Royce: It is looking good. We just started, so we still have a lot to do. Norm: What is your biggest goal for next year? Royce: Just to get better and more well rounded, work on my technique and become a better player. Freeman made himself a household name with his performance against the Spartans of Michigan State. Norm: Do you think you will have a bigger role this year considering the quarterback change? Do you feel like you will have to step up? Royce: I mean, there is always room to step up. We are looking forward to bringing that out in myself and the other guys. Norm: What is the game that you are most looking forward to? Royce: Honestly, I could not even tell you. We face a lot of good teams next year, but we are looking forward to playing a lot of competition next year. Norm: What is one thing that people do not know about you? Royce: (Laughs) I always get this question, is there anything you want to know? I am just a chill guy, I guess. I just like to kick it, relax, and have fun.